Sergeant Trevillyan of the Palmdale Sheriff's Station has spear headed assisting Paradise City get back on their feet. Last year, Paradise City, had the worst wildfire in California history burning over 141,000 acres of land. Eight of the nine schools in the district were burned down. At the end of March, Sergeant Trevillyan, will drive up to Northern California and deliver supplies collected to the rebuilding school district. 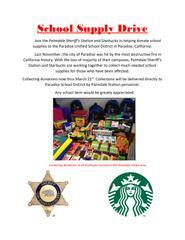 All Starbucks in the Antelope Valley have partnered with our station to the rebuilding of Paradise City. Next time you grab a cup of coffee at your local Starbucks, please bring any school supplies and place it in the collection bin.